King Causantin of Alba, ruler of the combined thrones of Dál Riata and Pictavia, had called a meeting of all of the northern Kingdoms, inviting representatives from the Britons of Alt Clud, the Scots of Dál Riata, the Picts of Pictavia, and the exiled Vikings who refused to serve the Norwegian King. 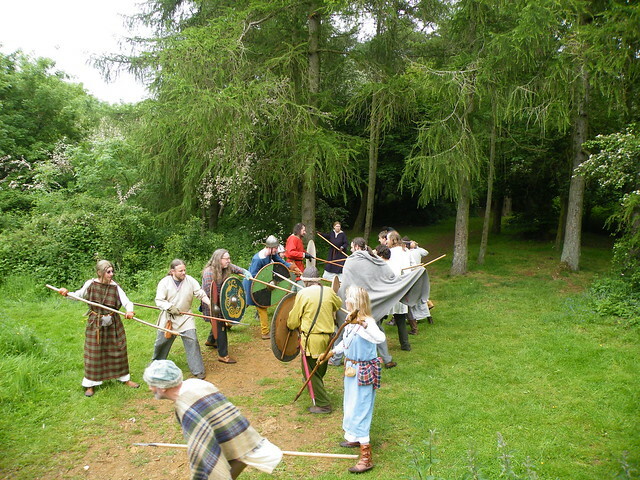 In the woods on the way to the meeting, the small bands of royal representatives clashed and tempers ran high. Secrets were uncovered about the past activities of all of the delegates, letters from years ago were looted and read, and a wandering monk made strange and terrible predictions about kingship. Alt Clud, sometimes known as Strathclyde, was the last great British / Welsh northern kingdom. Their capital was the great fortress of Alt Clud, Dumbarton Castle, which was sacked by Ivar Ragnarsson 6 years before this meeting, in 870. Their king, Arthgal, died 4 years ago in 872, in somewhat mysterious circumstances: it might have been illness, but it might have been poison… Alt Clud was now ruled by his son Rhun, married to the king of Dál Riata & Alba’s sister, Flann. My son, I am proud of you. You have grown strong and healthy, and will one day be a worthy successor to me. You also have a strong fire of ambition inside you: I believe that you may well be an even greater king than I. However, you have not yet proven yourself in battle, and you must do that before the people will follow you. I send you now to be trained by my most loyal advisor and friend, the man who made me what I am today. Listen to his advice, and he will guide you well. Without you, I would have nothing; it is you who made me into the man and king I am today. You have been a reliable figure by my side through the years, training and guiding me, as well as a strong warrior when needed. Without you, I would not have survived the burning of Alt Clud, and I would not sit on the throne. I thank you for your many years of good service, and I beg one more favour of you. I am too busy to supervise the training of my son Eochaid. He is a bold and ambitious lad, and I pray will one day replace me. But to do so he must first prove himself in the field of battle. He has often practiced and fought in play, but I ask you to train him to fight as a true warrior, to get him bloodied and achieve his first kill. Only then will the people accept him. Thank you for your many years of service. You came with me to Alt Clud from Dál Riata all those years ago, when I came to marry Rhun map Arthgal, and you have been a loyal friend to me. You have been my shield, protecting me from those who would harm me, and my most trusted friend and ally. Together we have steered our husbands, pushing them to be the best that they could be and to gain power and glory. Please do the same for my son, Eochaid. Help him to fan his ambition and drive for power, and he could achieve true greatness, greater even than my husband. 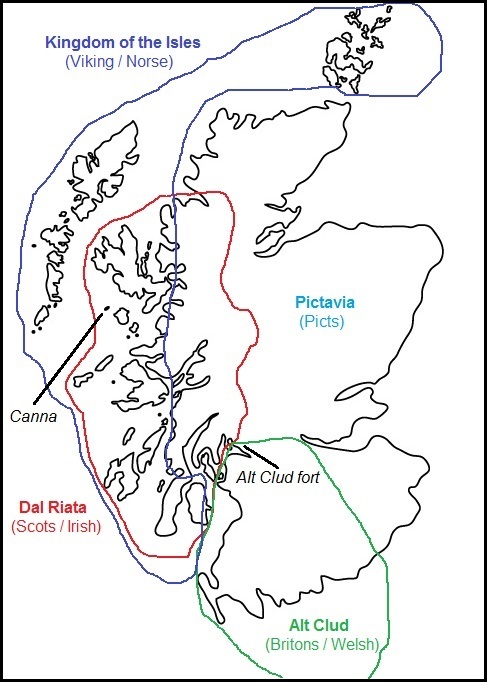 The Kingdom of Dál Riata on the west coast originally included most of the islands. The Scots came here from the sea: they were driven out of Ireland by fierce inter-family strife some 400 years ago. They brought with them Christianity, and it had vigorously spread out from such centres as Iona. They were ruled by Causantin mac Cináed, eldest son of Cináed mac Ailpín, brother to the queen of Alt Clud Flann and Aed (his current heir). You are my son, and one day will rule all of these kingdoms. But you are not yet old enough. So you must be careful, and avoid being captured by those who might do you harm. Don’t let anyone except for your guards know who you are, call yourself “Gormgus” and travel secretly. Trust your bodyguard Éremón and your nurse Orlaith to protect you, and take their advice, but remember that you are a prince. You are in command, not them. We must travel to the meeting by separate paths: it would be too dangerous for us to both go together, if we were ambushed we might both be killed. I will see you at the meeting. Good luck. I worry: will God punish me for what we did, or will he see that we did what we had to, to provide strong leadership to these lands? The Picts and the Scots and Britons were too fragmentary, too divided in the face of Englisc and Viking: they needed a strong hand to hold them together. My only regret is that I failed to command the Britons of Alt Clud. You and your troops have helped me be that strong hand, and have become some of my most trusted weapons. You are the youngest of my household troops, so to you I ask that you look after my descendants. One day one of them shall pull all of our peoples together, to repel the Englisc and the raiders. Guide my children, and guide my children’s children. Protect them, and help them to achieve their potential. You were always a loyal protector to me, my brothers, and my sisters. I ask you now to visit my sister Flann in Alt Clud. After that terrible raid they had recently, they are experiencing a time of hardship. Make sure that she is being well treated. If you encounter any of the Pictish trouble-makers there, make sure that Arthgal sees where his loyalties should lie. Pictavia is a broad term for the patchwork of independent ancient kingdoms on the east coast. The Picts were the original inhabitants of the whole area: before the Welsh or Scots arrived, there were Picts. But their time had passed, and their power was in decline. 30 years ago Cináed mac Ailpín, the Scottish king with a Pictish mother, killed most of the rest of the Pictish nobility and took the crown. He combined the Picts and the Scots into one nation, “Alba”, now ruled by his son Causantin. As you know, Cináed mac Ailpín only conquered the Picts through a horrific ambush. He lured all of our nobility to a grand feast, and then had his warrior Éremón slaughter them whilst they were guests under his roof. The brutality has not stopped there. Our people are ground under the yoke of the Scot oppressors. We lost our nobility to mac Ailpín’s treason, and are now ruled by his murderous son Causantin, with his father’s thug Éremón at his side. We must unite in order to regain our freedom. You and your husband Giric are the greatest amongst us. Your parents and Giric’s were cut down by mac Ailpín’s treachery, but you both survived. If you stand tall, and say that you seek freedom, many will listen and follow. We were sad to hear that your trip to get an alliance with the Britons of King Arthgal of Alt Clud was unsuccessful, as the butcher Éremón was also at court and argued against you. We must have allies in order to overthrow the Scots! Perhaps Arthgal’s successor will be more amenable? Or perhaps we could even make alliances with the Northumbrians, or the Vikings, or the Norwegians? We will follow where you lead. Vikings had been slowly settling on the islands off the coast of the land for the past 100 or so years, sometimes peacefully with agreed rents (like Hallgerd holding Canna) and sometimes more violently. In the past year, the Norwegian King Harald Fairhair (Hallgerd’s cousin) had swept through the islands, claiming them all as part of Norway and forced everyone to bend the knee or to be exiled. Whilst his advances on the mainland had been stopped, and he had left the rule to his servant Jarl Sigurd, Sigurd still ruled all of the Isles from Shetland to Mann with an iron fist. Grimkell, Hersir of the Westmen. I thank you for your aid in raiding Alt Clud. If you and your warriors ever want to march under my banner again, you will be most welcome. We put the fear of the true gods into those lily-livered White-Christ worshippers! I hope the raid was successful for you, and your ships left laden with silver? I am sorry to hear that Arthgal didn’t listen to your “little talk” about recruiting him as an ally against Dal Riata, so you wouldn’t have to pay rent any more for Canna. The pride of the man, to resist us even after we burnt his fort! I am sure you gave him a piece of your mind. 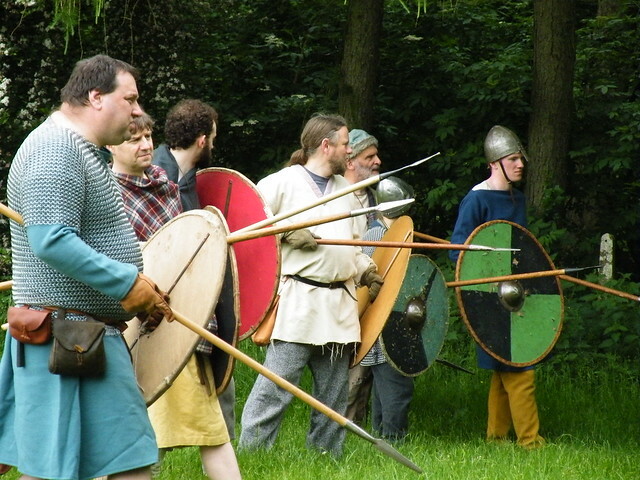 Your Welsh cousins in the North are having problems with Harald Finehair’s invasion. 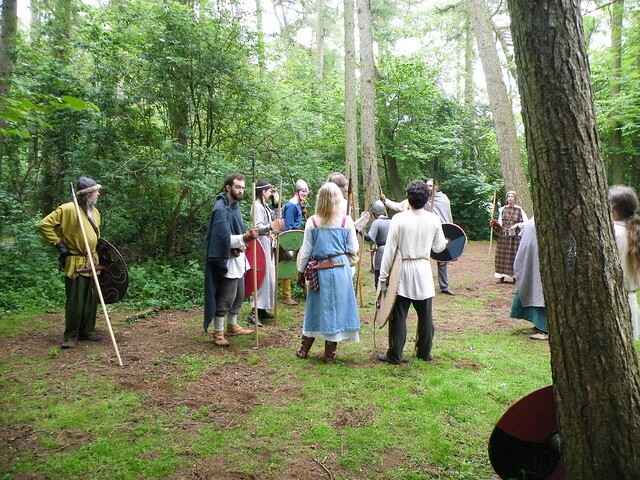 They seem divided and more interested in fighting each other than the Norwegians or the Vikings. What I would like is for them to be united, under a single powerful ruler, who will fight the Vikings and Norwegians but not the Northumbrians. Meanwhile I shall unite the south, and we will divide the country between the two of us. Do what you can to help them achieve this? 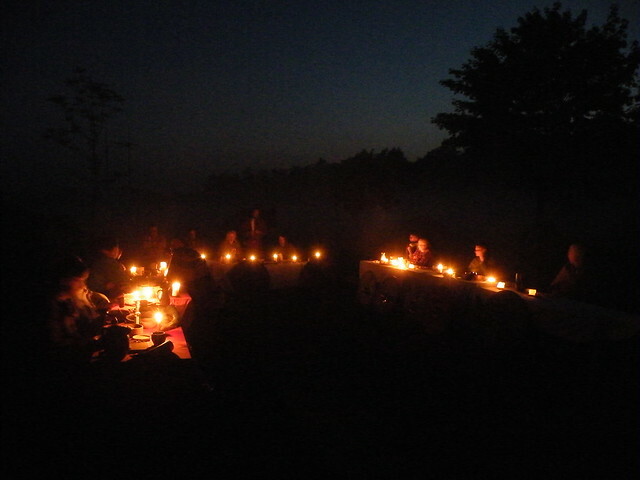 Try to sort out what is going on in their in-fighting, and give support to whoever can unite them? 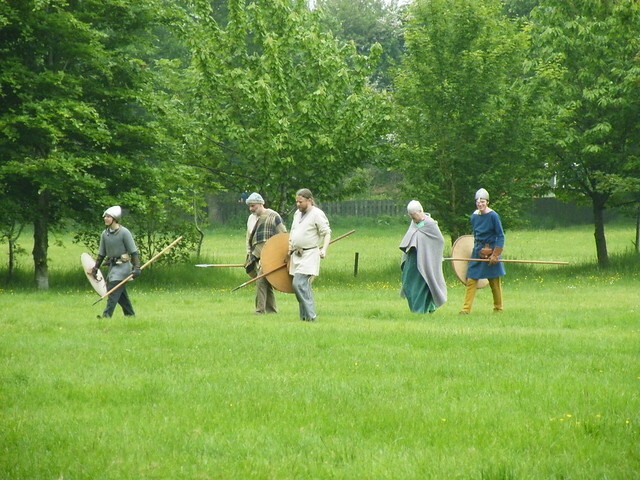 On the way to the meeting the Britons and Scots became united in friendship, based on their shared devotion to God, respect for kings, and the fact that both of their princes were grandsons of Cináed mac Ailpín; whilst the Picts and Vikings ended up as loose allies, united in disapproval of centralising rulers like Cináed or Harald. 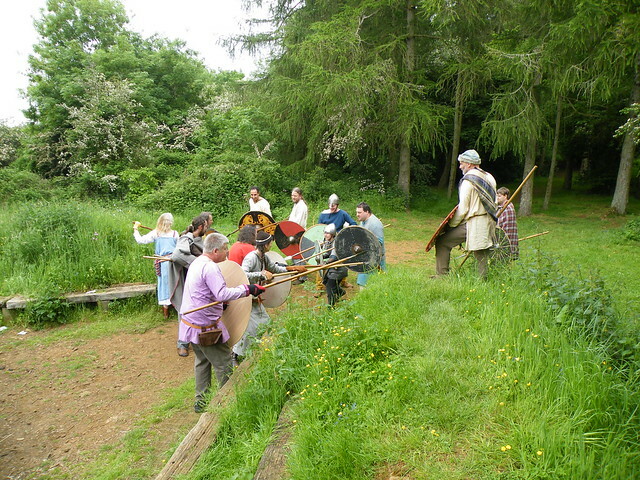 The factions only laid down their arms and forgot about their animosity when the two young princes, Eochaid of Alt Clud and Domnall of Dál Riata, proved their diplomatic skills by reminding everyone that the larger and more immediate target was the Norwegians, Jarl Sigurd and his King Harald Fine-Hair. Over a fabulous evening banquet, King Causantin of Dál Riata and Pictavia persuaded everyone to work together to fight that common foe. King Causantin’s servant asked if Prince Eochaid wanted Causantin to stand judge over the alleged murder of King Arthgal of Alt Clud 4 years ago, now that the letters had been discovered which might prove who did the terrible deed. 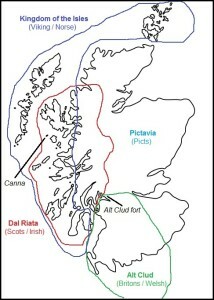 The letters (reproduced above) showed that King Arthgal’s court at Alt Clud was being visited at the time of his death by Lathir of the Picts, Hallgerd of the Westmen, and Éremón of Dál Riata, and might even suggest internal stresses inside his court… However, Prince Eochaid said that he did not want to seek a judgement at this time, that keeping the alliance united against the threat of the Norwegians was more important. Outside any formal legal proceedings many people speculated that Hallgerd was the probable killer, which she strenuously denied. Meanwhile, as a show of friendship, the Westmen returned a holy relic, thought lost in the burning of Alt Clud 6 years before, back to the visitors from Alt Clud, only demanding a very small fee for the years of protection they had given the relic. 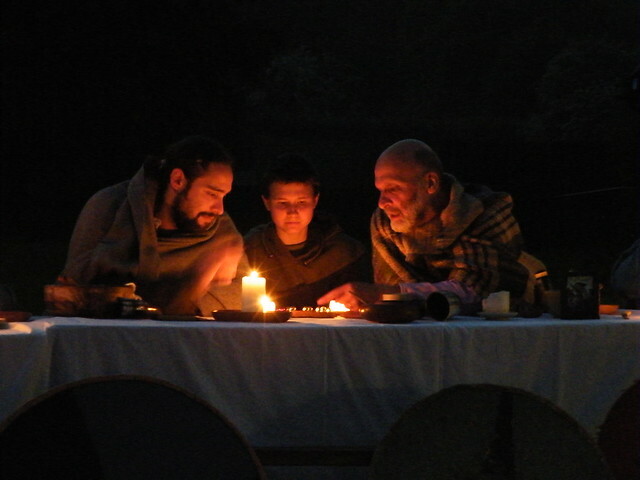 Among other discussions, King Causantin was persuaded to send his young son Domnall off to be fostered by the great Viking Styrkar, a famed foster-father who would return Domnall when he had come of age, with fighting experience and ready to rule. In the weeks that followed, Causantin’s brother Aed took control of the throne, despite some people claiming that Domnall or even Eochaid should be the ruler. But the lands of the north were still torn, with the list of unavenged murdered kings growing ever longer; the Picts still seeking their freedom; the followers of Domnall and Eochaid both pushing their claims to the thrones; the Norwegians still triumphantly holding the isles; and the monk’s prophecies not yet fulfilled. Clearly there are more stories to be told in the north, more adventures and excitement to come! Exactly what was going on in Scotland at this time is a bit unclear, and the reports are contradictory. Our version of history sticks to some of the sources, but obviously can’t follow them all. Historically, Cináed mac Ailpín might have just been a Pict, and “MacAlpin’s Treason” is probably just a later medieval legend. But it was just too cool not to include, and who doesn’t love some simmering racial tension? Similarly how and when Arthgal and Causantin died is disputed but none of the sources match the deaths we gave them, some king lists omit people that we included, and we invented all of the bodyguards and gave names to unnamed figures (particularly the women, who aren’t included in the king lists that give us so much of our contemporary knowledge). The importance of the mad monk with prophecies was meant to reflect the Witches of the Scottish Play (which is actually set 200 years later) and the medieval epic poem known as the “Prophecy of Berchán”. This entry was posted in DAS Chronicle and tagged 2016, 876, Alba, Alt Clud, Beath map Beath of Alt Clud, Canna, Cynric, Dál Riata, Éremón of Dál Riata, Grimkell, Hallgerd, Jarl Sigurd, King Aed of Alba, King Alfred of Wessex, King Arthgal of Alt Clud, King Causantin of Alba, King Cináed mac Ailpín of Alba, King Domnall of Alba, King Eochaid of Alba, King Giric the Pict, King Halfdan Ragnarsson of Jorvik, King Harald Fairhair of Norway, King Ivar the Boneless, King Rhun of Alt Clud, Lathir the Pict, Oestvikingae, Picts, Scotland, The Kingdom of the Isles, Westmen. Bookmark the permalink. Follow any comments here with the RSS feed for this post. Both comments and trackbacks are currently closed.